From bebop rhythms to sweet melodic ballads and swinging romps forged with exciting solo statements, the Verve Jazz Ensemble delivers quite an attention-grabbing first effort! I'm relatively new to jazz, and this CD is now one of my favorites. Great arrangement, the way the instruments play off one another is masterful. Inspiring music, am looking forward to more from VJE! "The CD is fabulous--great job!! This group sounds really tight!" Superb musicianship and fresh and innovative arrangements of timeless jazz standards combine to yield listening perfection. The CD’s in heavy rotation on my system—as music to work to, cook to, and as a brilliant soundtrack for entertaining. It’s about time the Verve Jazz Ensemble hit the studio—and came to my attention! Hopefully little time will pass before Verve’s sophomore release. This CD masters the twofold purpose of jazz as both a player's music and a listener's music. The latter purpose is much harder to satisfy, and from a listener's standpoint, I must get it out there that this music is not listenable once, but again and again and again! I know that the members of VJE are talented and passionate for what they do, and this record truly captures all that and even more dynamic to their musicianship. Their interpretations are sleek and full of surprises to discover with each new listen. Great music for anyone's collection and a great debut for a band in their prime! Can't wait to hear more from these guys! When i downloaded it, I listened to it in its entirety, and Im looking forward to playing it again this evening. Great job VJE! I never considered myself a jazz listener, until I heard the Verve Jazz Ensemble. I received their album as a gift and I can't stop listening to it. It's not completely out there like some jazz I've heard and it's not boring. It's an engaging listening experience with twists and turns along the way. I highly recommend especially if you are like me and don't know where you stand on listening to jazz music. Simply put, the group is tight, the arrangements work well for the group, and overall really enjoyable to listen to. I definitely recommend picking it up. Great job! We simply love this cd. It is beautiful & haunting with its subtle Latin influence. A keeper worth sharing! Love this CD! Some great Jazz! 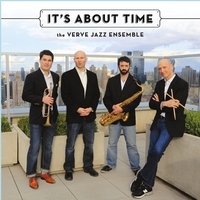 I played it at a recent party and everyone loved it, we can't wait for more from the Verve Jazz Ensemble! The Golden Age of Jazz is alive! Smooth and vivacious jazz with the exquisite authenticity of the Golden Age of Jazz and all the freshness for today's listeners. We just put our car trip play list together and we put The Verve's "It's About Time" on first, in the company of David "Fathead" Newman's "Mr. Gentle, Mr. Cool", followed by Dianne Reeves, Jane Monheit, Michael Feinstein. This is a phenomenal first CD and we can't wait for their second. New York Clubs take note! We want to see them live in Mew York City!